Hello. I'm Sehba Tahir, (Owner and Centre Director) of Mathnasium of Oakville, your neighbourhood math-only learning centre. We help kids in grades K -12 understand math by teaching the way that makes sense to them. 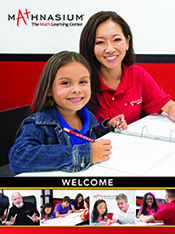 Mathnasium of Oakville has been offering math tutoring and homework help to hundreds of students in the town of Oakville since early 2012. Our qualified and expert staff is passionate about helping kids in our community improve and excel in school through our year-round and summer math programs. Mathnasium of Oakville is a Platinum Award Winner for the "Best Learning Centre" in Oakville. Call us today at (905) 829-9400 for a FREE consultation and trial and see how we can help your child! Our son has been with Mathnasium for about 4 years. He loves to study there with his instructors and we think the environment is great for him. Mathumnasium has helped remove the fear and anxiety out of Math! Mathnasium has provided excellent support for my children. I have already recommended them to many of my friends. It's a great team at the Mathnasium Oakville location. My daughter enjoys going there and her confidence in her math skills is constantly growing. Mathnasium have really made a difference in my child’s life. He knew things but not confident about knowing...He was in between the correct and wrong thanks to the wonderful team For helping him ,motivating him.He is blooming and ready for all challenges maths throws on him!!!! In the short time my son has been coming to Mathnasium, he has not only enjoyed his time there, but his confidence in Math has grown. Thank you! My daughter loves it and she used to be a kid who hated math. Thanks a lot to all Mathnasium personnel, to welcome my son Sebastian, and help him to improve math understanding and skills. My wife and I really appreciate all your exceptional help. My daughter is always looking forward to her maths class, she is fearless of maths now as well as enjoying it, and is doing well in school. Thank you and keep up the good work. My kid just likes the classes. Wants to go on. Mathnasium has helped my son incredibly! He says all of the instructors are amazing! I highly recommend Mathnasium! My son loves to go to Mathnasium and study. All the staff are very friendly and the instructors are great at tutoring. Yiur staff are very encouraging and help boost confidence. My son went from getting 2’s on math to getting 4+ !!!! Mathnasium has great teachers and encourages the kids to learn. My daughter struggled with math since grade 1. Now she is entering grade 3 and going to mathnasium over the summer and she loves it. She literally can’t wait for her classes. My son started Mathnasium in August 2017. He had struggled with Grade 10 Math that year and we felt he needed to overcome that before the start of Grade 11 Math. He attended Mathnasiun 3x/ week before school started. The first term of Grade 11 Math was tough but he faithfully attended Mathnasium 2x / week all year, including all the Holidays. Persistence and great help from Mathnasium paid off and he was getting over 90 percent on his final math tests. He finished the school year with a respectable 81 percent in Grade 11 Functions.A great achievement considering he only got 50 percent in the Christmas exam. Currently he is taking Grade 12 Advanced Functions at summer school and is attending Mathnasium 4 x/ week. I highly recommend Mathnasium for students of any age who need extra math help. Our daughter is improving in math and feeling more confident. I will and have already recommended Mathnasium to others! Great place for my kids to help them get better in Mathematics! Lauren really found the confidence she needed to make grade 11 math easy. Thanks again for always being there for her. So far the experience has been great and Madison is enjoying the sessions. Everyone is very friendly, pleasant and helpful. The only reason I have not given a 10 is that we have not been attending long enough for me to determine whether the sessions are actually improving Madison's math skills as yet. I am very happy with Mathnasium and have recommended to several friends and family! They are very flexible with scheduling and my son has found it helpful. Your team is doing a good work . Hi, Teachers are great. Johnny says he really likes the way it’s set up as opposed to when he had an in home tutor. The pricing and the long term commitment is the one thing that keeps me from giving you a 10! Mathnasium has been a great experience. I would not hesitate to recommend them (which I have already) to others looking for high quality math tutoring. We have started just recently and so far my children both have positive feedback on their experiences. Mathnasium's methodology of helping my daughter with math really helped build her confidence in the subject. They worked with her on relative subjects for her grade, and if she had specific needs they were always open to switch gears and focus on that. They provide a great learning environment! My daughter's math skills improved with Mathnasium. Thanks to a great team. My Son like to go to Mathnasium. We had enrolled our son a year and a half ago for a brief period and then discontinued. Later, he one day insisted that he wanted to join Mathnasium again. He has improved his skills and always looks forward to his sessions. Starting with the fubdamwntals has really helped Natalie. She has more confidence. We will be returning in september for sure. Have only been attending for a few weeks but my daughter is already seeing an improvement in her grade 10 marks. Mathnasium helped my son understand concepts he was working on in class and his grade increased shortly after starting this year. This is our second year at the Oakville location and we find the staff friendly and approachable. Actually, it was my son who wanted to come to Mathnasium for the second year and that tells me that he finds it useful. I would highly recommend Mathnasium! The approach is exactly what my daughter needs to succeed. Working on the things she needs to each time versus what you think she needs. She looks forward to going each time. Thank you! After years of struggling in math class and failing grades, my daughter now gets 80's and is a confident math student. The staff who worked with my daughter were helpful and friendly. The Mathnasium evaluation process helped us understand what our daughter needed to learn to achieve better grades. I highly recommend Mathnasium. My child and I love the teachers, Manas and Kim. They are both clam, extremely patient and connects well with young kids. These are all important traits to be great teachers. They definitely make the learning experience a success for my child. Thank you. We have had both of our children in for acceleration rather than remedial work. It has been fun and rewarding for them both. We are seeing 90's and abilities above grade level. Thank you for your great teaching and inspiring. My son enjoys attending mathnasium and he is doing very well at school. Peace of mind for the parents. Hello Ms. Sandra, Thank you for your continued support and feedback. Your son indeed enjoys the time that he comes for his Math at our Oakville location. I'm impressed with the level of knowledge and professionalism shown by management and staff (tutors). My son feels as if he has learned quite a bit since starting in September and finds the tutors encouraging. The setup is organized but the overall atmosphere seems unusually quiet; more like a church instead of a place of learning for kids. Also the washroom facilities could be better maintained. Overall, I'm pleased with the service provided. mt daughter enjoys attending her sessions at mathnasium. She has also learnt some neat tricks to help her with her current work st school. Payton's confidence has really increased. The instructors were all verycaring and knowledgeable which allowed Payton to be her best. Mila loves going! Her marks have improved, but better still, her Math confidence has increased tenfold. The rewards system works extremely well to keep her motivated and the easy going nature of the tutors make it a pleasure for her to go to Math. She loves it! Our daughter has been attending Mathnasium for almost 3 months. Her struggle with math was effectively identified with the Mathnasium diagnostic skill test. We were alerted to her urgent need to upgrade her basic skills with this test. We now understand why all the regular tutoring in the world would not help and why she just could not grasp new concepts firmly. We never imagined that the mainstream school system would let a child fall through the cracks so dramatically and for so long and it just went completely ignored. She is getting the basics she is missing now and her confidence is growing. She tells us that Mathnasium is a fun safe place for her to learn. My son went to Mathnasium for help with his Gr10 math. I'm very happy to say he passed! The staff was great and James really enjoyed going. I have already spread the word to other parents that if their child needs additional help that they should consider checking out Mathnasium.